Worldwide icon-chevron-right North America icon-chevron-right United States icon-chevron-right New York State icon-chevron-right New York icon-chevron-right OddFellows Ice Cream Co.
Former wd~50 pastry chef Sam Mason—of BK dive Lady Jay's and artisanal condiment company Empire Mayonnaise—returns to his sweet roots with this 20-seat ice cream parlor in Williamsburg. Inspired by old-school soda fountains, Mason fills the lofty beige room with vintage accents, including a chalkboard menu, custom wooden stools and dangling schoolhouse lights. 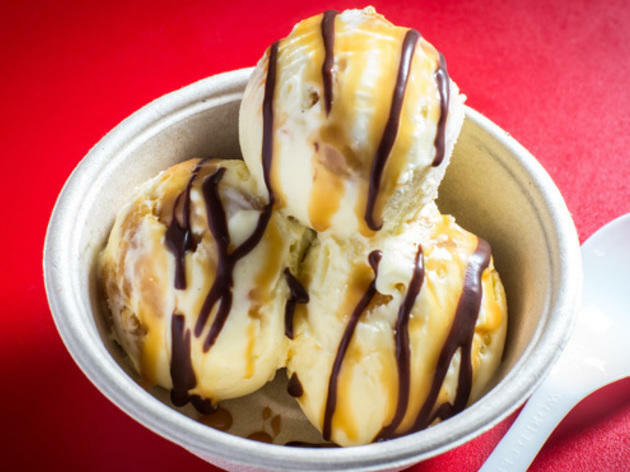 A rotating selection of 12 ice creams—served in cups or hand-rolled cones—showcases his avant-garde repertoire with flavors like corn bread and chorizo-caramel (the eccentric combos inspired the shop's name), along with more familiar options such chocolate chunk and burnt marshmallow. Nab a seat at the red-topped counter for house-made sodas and thick shakes spun from the daily offerings. I went to the opening of the new Domino Park and as I was heading out saw OddFellows and decided to stop in. I loved it! The scoop stacks are very picturesque - reminds me of the ice cream you'd see in cartoons. A "flight" includes 6 scoops. The quirky circus theme was fun and the flavors were delicious. Strawberry Jam was my favorite. It's a great summer spot and so close to the park, I recommend stopping in if you get the chance! cute spot with unique decoration that carries out the circus theme throughout. we ordered the Crmlz'd White Chocolate & Toasted Almond *which I LOVED, the crunchy almond is perfect with white chocolate* and the oddfgato. the oddfgato is hot chocolate with roasted marshmallow ice cream and whipped cream - kind of wish we could taste the ice cream flavor a little more. The first thing you notice when you go in is the sweet and warm smell of freshly made waffle cones. Right there the decision is made: you are getting a cone, now to the hard part: what flavor, seriously who are we kidding flavorS. You look at the board and don't know where to start: Olive Oil, Coffee Crunch, Blueberry Buttermilk, Miso Cherry, Peanut Butter and Jelly....Oh my! Thank the gods of mercy they let you try all the flavors before you choose. I started coming to Odd Fellows since the first day they opened, every other night I would come by and try a new flavor, talk to the owner, and be on my way content with my choice, eating my calories away, but oh so worth it. My favorite si Miso Cherry, sweet and salty, the cherries are perfect a tangy, sweet, and perfect pop of flavor, then you get the saltiness of the miso, mixed with the perfect churned cream. The best ice cream in New York hands down! 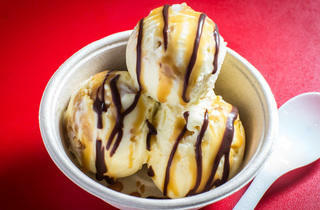 If you love your ice-cream then Oddfellows should be high on your checklist of places to check out. I was fortunate enough to visit the Williamsburg location after strolling along the Brooklyn promenade and this really hit the spot. The first thing you see is just how many different flavors they have on offer and not just your standard chocolate, vanilla and strawberry but flavors like Creme Brulee, Coffee Crunch, Pecan Pie - the list is endless. In fact since inception they have offered over 200 different flavors so you are in good hands. The service is friendly, the environment chilled (no pun intended) and you can sit and just people watch while licking away at your favorite flavor. A definite visit should you ever find yourself in Williamsburg. One word- YUM! Their ice cream is so unique and is so creamy and good. They are so accommodating with trying how ever many samples and they so great at recommending what flavors to pair with each other. I had a mix of three different ice creams all flavors I never knew could exist with infused alcohol to exotic chocolate . And to put a cherry on top- it wasn't over priced. Oddfellows is my favorite ice cream place! I think it beats Van Leeuwen's out of the park. There are so many unique flavors—olive oil, Tobacco Leaf Smoked Chili Huckleberry, Guinness, Thai Iced Tea, Miso Butterscotch Cherry, etc—that are all made in house and change often. Of course, on a hot summer day you're never the only one that wants ice cream, so get ready to wait in line if you're going on a weekend or during peak hours. It's so worth it though! You'd better splurge on a homemade cone and sprinkles too, or even go wild for a banana sundae. You earned it! You're worth it! Oddfellows is great when you want an ice cream that you wouldn’t find in a traditional scoop shop. The menu always changes, but I never leave empty handed. They have traditionally sweet (but still unique) flavors like peanut butter & jelly, sprinkles and caramelized white chocolate, but also feature much more unusual flavors for those that like to try something a little different. The best I’ve tried has been ants on a log (celery with peanut butter and raisins), but other flavors I’ve seen are: olive oil, grapefruit jalapeno. Not for me, but people seem to love them! They also have ridiculously good ice cream sandwiches and sundaes. If you have an appetite, get a sundae! Near OddFellows Ice Cream Co.